Sometimes the video and song are just so insane, so over the top, so much fun that they transcend mere cheese and become something much MUCH more. 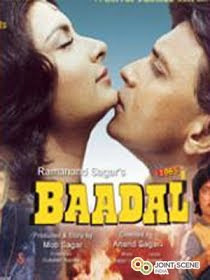 Today's song from the 1985 film 'Baadal' starring the disco dancer himself Mithun Chakraborty is one of those. Sung with great gusto by the great Kishore Kumar, this song just dares you to not sit up and take notice of the insanity. And when you have copious amounts of bhang, the voice of Kishore, the music of Bappi Lahri, the charisma of Mithun set among the backdrop of the Vale of Kashmir the result is nothing you can really explain - you just have to watch it to understand. In my opinion, you get to be a legend in either music or movies if you do 3 great things. Bappi Saab was responsible for the music from 3 of my favorite soundtracks with Sharaabi, Namak Halal and the very underrated Pyara Dushman. Mithun never wowed me when he was at his prime but did so in Agneepath and Guru. You got one more good role in you Mr. Chakraborty?